ChessOK.com » Rybka 4 UCI Released! Rybka 4 Aquarium and Opening Book by Jir Dufek will be available in a few hours. Stay tuned! Please note, that (Deep) Rybka 4 Aquarium or Chess Assistant 11 already include Rybka 4 UCI / Deep Rybka 4 UCI without any additional payments along with a bonus program of Openings Encyclopedia 2010. There’s also a 30% discount package of Rybka 4 Aquarium + Chess Assistant available for order. 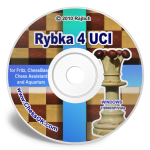 Rybka 4 UCI / Deep Rybka 4 UCI can be used in all modern chess programs such as Aquarium, Chess Assistant, Fritz, Shredder, Chessbase, Arena etc.